How does that once-popular song go? It’s Friday, Friday … Yes, it’s FRIDAY! It’s already shaping up to be a good weekend. It’s Ryan’s weekend off of work, and the weather is supposed to be beautiful! We have a little shopping excursion planned, maybe a movie (if not at the theater, several Redbox trips), and some fun projects around the house to work on. Wherever you are and whatever your plans are, I hope you have a great weekend! Here’s my recap of the week. 1. The entertainment center/bookshelves are decorated! I couldn’t be happier with how it turned out. It will always be a work in progress – changing photos, adding new books/getting rid of old ones, etc. We are still trying to figure out how to hide the jumble of cords that are underneath the middle section – maybe taping them to the bottom? I welcome any suggestions. 2. I THINK we finally caught all the mice that were getting into our rental house. So far, our casualty count is up to four, and I hope to keep it that way. I know we can’t have the little creatures running around the house, but it still makes me sad that we have to kill them. The joys of home renting! 3. 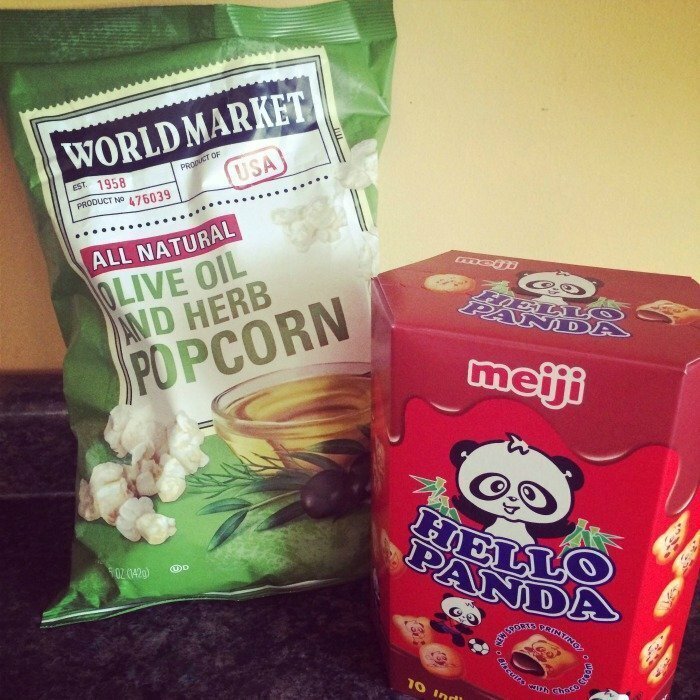 My tip of the week – never EVER go into World Market on an empty stomach. You will buy unnecessary food. On the upside, that popcorn is delicious and healthy (140 cal per 2 cups and only 140 mg of sodium), and those cookies are knockoffs of Koala Yummies – my absolute favorite cookie/dessert as a child. Anybody else remember those? I may be showing my age. 4. I made an appointment to get my hair cut and colored next Wednesday. I can hardly contain my excitement for this – it’s been too long! 5. Because it is supposed to be relatively warm this weekend, this vintage beauty will finally be relocated to our garage for us to get to work on! 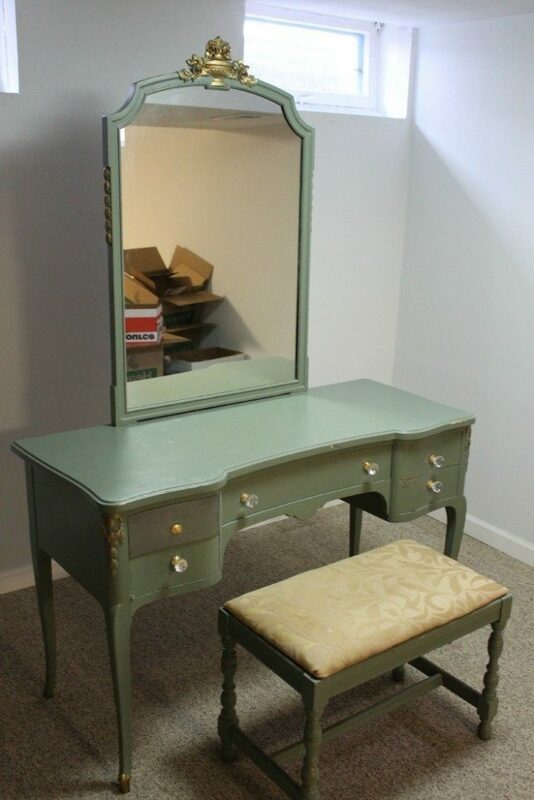 I bought the vanity off Craigslist last month, and I am so excited to get to work on it. It always has been my dream to have a makeup table, let alone a vintage one from the 1940’s. I will be documenting the entire refurbishing process and plan to write a whole post about it once it is finished. Your entertainment center looks awesome and I LOVE that vanity! When we move next, a makeup station is an absolute must have! Fingers crossed for no more mice! Love that vanity, makes me want to search craigslist for my own! Can't wait to see how it turns out! Thank you! The vanity is going to be a big undertaking, but I am so excited to make it look the way I always have envisioned. Hope you have a wonderful weekend! Yes, our DVD collection is a bit out of control. We said we have to quit buying them otherwise we won't have room for them anymore! Oh well, there are worse things we could love, right? 🙂 You must go to World Market – they have an awesome selection of food and beverages! Thank you! I am so excited to get to work on the vanity – it's a dream come true for me! Thanks for stopping by – have a great weekend! Yes, all three bookshelves are separate from each other. They are from the Target Threshold Carson collection – they only are sold online and come in all different colors. Hope that helps! Thank you! I am SO excited to get to work on it. Ha ha, I was wondering if anybody would catch that. My husband and I call that "our movie" since it was the first movie we ever watched together when we started dating. How cheesy, right? 🙂 Have a great weekend! Yes, us too! Hope you have a great weekend. I have always wanted a makeup table and that vintage one is gorgeous! Love how you're watching How to lose a guy in 10 days in the first one 😉 My favorite movie! Love Love Love Love the vintage makeup table!!! Can't wait to see how it turns out! 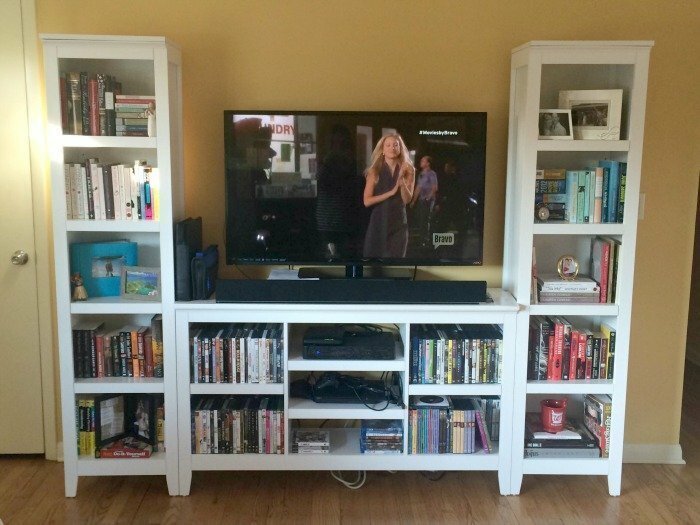 Are the bookshelves a different piece not connected to the entertainment center? If so – where did you get them! Hope you have a fantastic weekend with your hubby! Hope you and Ryan have a fun weekend! Looking forward to seeing the vanity transformed – you've been wanting that since you were a little girl! Glad you finally found your Koala Yummies, even if they're now called Hello Panda! Are you kidding me???? That vanity/desk is beautiful!!! I can't wait to see what you do to fix it up a bit! And the entertainment piece looks amazing with everything in it– looks like you guys have an awesome DVD collection! I haven't been to World Market in forever, but after this post I might need to make a quick trip sometime soon 🙂 They do have the most fun selection of snacks!